There’s no denying that the prevalence of cloud-based solutions – in nearly all facets of life, business and beyond – has steadily surged, mostly notably in recent years. With the potential for increased storage, readily controlled remote access to data, extensive utility and minimized cost, it’s no wonder why the ever-reaching cloud has gained such an intense level of popularity. For the security and surveillance markets in particular, the breadth and availability of cloud-based solutions has shown incredible growth. This technology often carries a perception of unattainability for many small- to mid-sized businesses, whose owners may view migrating to a cloud-based video solution as completely out of their grasp. 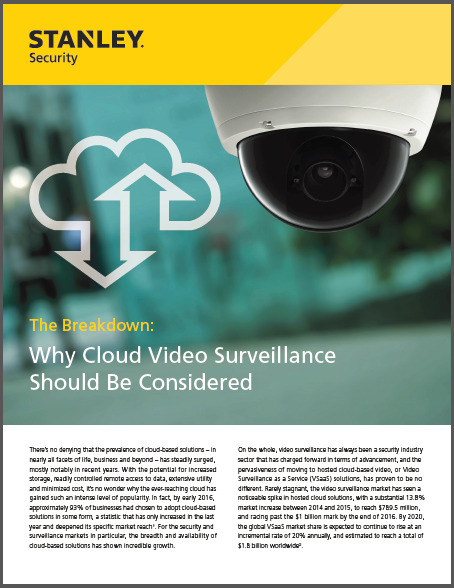 This informative whitepaper will help you better understand the benefits and cost-effectiveness of cloud-based video solutions.